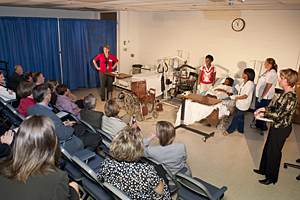 Theatre students playing the part of sick patients are cared for by students in the nursing and physical therapy programs. Here, "patient" Candice Pryce receives care. Theatre student Zachary Jackson feigns a head injury. Amy Cowperthwait, laboratory coordinator in the School of Nursing, prepares Zachary Jackson for his role. 2:05 p.m., April 28, 2010----Candice was a college soccer star until a spinal cord injury sustained in a car crash left her paralyzed from the waist down. She lies in her hospital bed, rolling her eyes in disgust at the upbeat manner of the physical therapist and two nurses who come into her room to get her up for the first time since the accident. Zack, also the victim of an auto accident, displays the erratic behavior of a head-injury patient. He picks frantically at the tape holding the IV in place on his hand, lashes out in unprovoked anger at the medical staff, and sags to the floor when they finally pull him to a standing position. His affect swings wildly from impassive silence to barely contained fury. Fifteen minutes into their sessions with the hospital staff, the two patients get up and walk across the hospital room unassisted. Candice Pryce and Zachary Jackson are actually theatre students, and their performance is part of a novel approach to educating future healthcare professionals at the University of Delaware. Their nurses and physical therapists are also students, who are presented with a realism that they would not encounter in practicing on mannequins or each other. On Friday, April 16, a small group of faculty, staff, and alumni had the opportunity to see these two live simulations, when a classroom in UD's McDowell Hall was temporarily turned into a small theatre, complete with raised seating, curtained walls, and a spotlighted stage. According to Tara Jo Manal, director of clinical services in UD's Department of Physical Therapy, the program is based on the concept of the standardized patient, an individual trained to consistently simulate a specific medical condition or disease. The collaborative program at UD focuses on teaching future medical professionals how to deal with not only the physical symptoms but also the emotional responses of their patients. “When people are in the hospital, they're stressed and that's what we want to simulate,” said Amy Cowperthwait, laboratory coordinator in UD's School of Nursing, during a debriefing following the simulations. The program also provides the acting students with valuable experience in accurately portraying the behavior associated with various diseases and disabilities. In addition, it prepares them to handle unscripted scenarios.